We have a prediction: by the end of this article, you’re going to be shocked at all the financial aid resources that are available to residents of Kentucky. In fact, Kentucky has so much to offer, you might be wondering where to start. No problem. We’re going to walk you through all of your financial aid options, step-by-step. The first step to finding financial aid is clear: apply for FAFSA. The FAFSA, also known as the Free Application for Federal Student Aid, is the government’s way of granting financial aid to students going to college. Over $150 billion of this need-based financial aid goes to students like you every year. Tip: you should apply for the FAFSA even before applying to any colleges. Why? Because many institutions use the FAFSA to determine how much aid you should receive from their financial aid office. However, we will admit that the FAFSA can be quite complicated. That’s why we’ve created this step-by-step guide to completing the FAFSA questions, which will walk you through every question and make your application process much easier. Another reason to apply for the FAFSA: it’s one-stop shopping for other forms of aid. Applying for FAFSA automatically qualifies you for federal loans, and some state and institutional scholarships. Skipping the FAFSA may mean leaving free money on the table. Why would you want to do that? After you apply for the FAFSA, be sure to check out all of the state funding that Kentucky has to offer students. The Kentucky Higher Education Assistance Authority (KHEAA) website is your go-to website for finding all of the scholarships and grants available to students like you. Let’s look at some of the scholarships available to Kentucky students. Kentucky Educational Excellence Scholarship (KEES) provides funding to students who have a GPA greater than 2.5. This scholarship also awards students with funding based on test scores for the ACT/SAT and AP/IB. Early Childhood Development Scholarship is for students who are committed to studying and working in early childhood education. Kentucky Coal County College Completion Scholarship provides financial assistance to students who are permanent residents of a Kentucky coal-producing counties..
Work Ready Kentucky Scholarship Program provides aid to students who plan to attend a Kentucky community college or technical school. There are also many grants that are offered to Kentucky residents. College Access Program Grant (CAP) gives funding to financially needy residents of Kentucky who are attending specific universities. Kentucky Tuition Grant (KTG) awards financial aid to students who have demonstrated financial need and who plan to attend a private college in Kentucky. KHEAA Work-Study Program gives students the opportunity to have a work-study job to help cover tuition costs. Go Higher Grant provides funding for Kentucky residents over the age of 24 who wish to pursue a college degree. You’ll also be happy to know that many colleges and universities in Kentucky are committed to making tuition affordable for all students. Let’s look at the University of Louisville, which offers many scholarships broken up into several categories. Guaranteed Scholarships are based on test scores, as well as high school GPA, and offer up to full in-state tuition to students who have superb academic records. Competitive Scholarships include the Woodford R. Porter Scholarship, which is awarded to African American students based on academics, leadership, and service. Finally, the University of Louisville’s Mentored Scholarships are selective scholarships for students who were academically distinguished in high school. The University of Kentucky is the state’s largest university, educating over 27,000 students per year. They also have many great scholarship resources for students. Take for example the Provost Scholarship, which gives students with a certain ACT/SAT test scores $1,500 per year to help with tuition. Next, the William C. Parker Scholarship awards funding to students who have demonstrated leadership and are academically distinguished, who are African American, American Indian, Asian or Pacific Islander, Hispanic, or Alaskan Native students. There is also the Rogers Scholars Scholarship, which is a summer program that high school students can attend to work on leadership, technology, entrepreneurship, and community service. Students can also receive a scholarship from completing the program. As you can see, there are many financial opportunities that institutions have available to incoming students. Be sure to check out the financial aid websites of the schools you plan to apply to to find all all of the opportunities for scholarships, grants and tuition aid. Once you’ve completed the FAFSA, applied for state funding, as well as institutional financial aid, and any other scholarships and grants you might be eligible for, you might still be unsure of how to fund the rest of your tuition. At this point, you should consider a private student loan to pay for the rest of college. 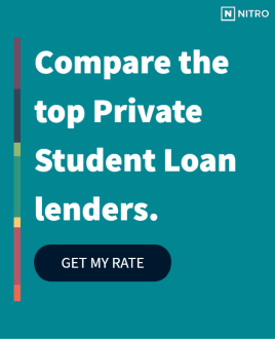 Check out our picks for the best banks for private student loans to get started. For all of the students who like to be one step ahead, we also created the NitroScore tool to give you a good idea of what your financial situation will be after graduating from college. With NitroScore, understanding your finances will be easier than ever, and you can go to college rest assured that you are in control of your finances and your future!